Toronto, Canada, February 8, 2005 – The “high priests of the percussion world” (New York Times) Nexus has been nominated for a 2004 Juno Award for Drumtalker (Nexus Records 10713) in the Best Classical Album of the Year: Solo or Chamber Ensemble category. Drumtalker features Peter Schickele’s Percussion Sonata No. 2 – “Woodstock”, written for NEXUS and commissioned by Woodstock Chimes. The work features wind chimes, and a vibraphone played with a bass bow. The disc opens with Russell Hartenberger’s Invisible Proverb incorporating talking drum styles, rhythmic patterns of West African drumming and a song by Toru Takemitsu. The final work, Four Medleys, pays homage to the 1920s and 30s “golden age” of xylophone, and includes arrangements of favorites including Bye Bye Blackbird, Bye Bye Blues, Whispering, Dinah, and When You’re Smiling. NEXUS burst on the scene in 1971 with an entirely improvised concert, capturing the attention of audiences and colleagues in a way that continues to this day to excite listeners at all levels of musical understanding and in all genres of percussion music. The group has toured worldwide, including the People’s Republic of China, Australia, New Zealand, etc. NEXUS has also enjoyed participating at international music festivals around the globe, including the Adelaide, Holland, Budapest Spring, Singapore Arts Festivals. One of its signature pieces, Takemitsu’s From Me Flows What You Call Time, was premiered at Carnegie Hall’s centennial celebration in 1990 with Seiji Ozawa conducting the Boston Symphony Orchestra. Nexus has performed the work over 80 times with orchestras across the globe from Los Angeles and San Francisco to Chicago and Philadelphia, to London, Hamburg, Lyon and Tokyo. The ensemble recently premiered a new work, written for it by Ellen Taaffe Zwilich and looks forward to another new work by Richard Danielpour for percussion ensemble and piano, with Jeffrey Biegel. 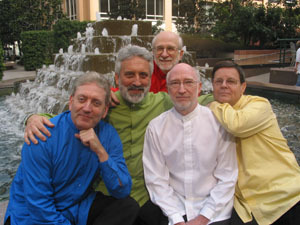 Bob Becker, Bill Cahn, Robin Engelman, Russell Hartenberger and Garry Kvistad are the virtuosos who bring elements of their individual knowledge and character to a distinct and powerful whole as the internationally acclaimed NEXUS Percussion ensemble.